With a share of up to ten percent, ethane is the second most common component of natural gas and is present in deep-seated land and marine gas deposits all around the world. Up to now, it was unclear how ethane is degraded in the absence of oxygen. A team of researchers from the Helmholtz Centre for Environmental Research (UFZ) have solved this mystery, after more than fifteen years of research work in cooperation with colleagues from the Max Planck Institute for Marine Microbiology in Bremen. In a microbial culture obtained from Gulf of Mexico sediment samples, the scientists have discovered an archaeon that oxidises ethane. The researchers had to demonstrate a great deal of patience in solving the mystery of anaerobic degradation of saturated hydrocarbons. In 2002, UFZ microbiologist Dr Florin Musat, who at that time was conducting research at the Bremen-based Max Planck Institute for Marine Microbiology, received a sediment sample originating from the Gulf of Mexico. The sample had been collected from natural gas seeps at a water depth of more than 500 metres. It took over ten years of cultivation effort to obtain sufficient quantities of the culture containing the archaeon – as the basis for detailed experiments to decode the structure and metabolism of the microbial community. During his regular measurements, Florin Musat recognized that oxidation of ethane was coupled to reduction of sulphate to hydrogen sulphide. “For quite a long time, we thought that the anaerobic degradation of ethane was carried out by bacteria in a similar way to the degradation of butane or propane, but we were unable to identify metabolic products typical for a bacterial mechanism of oxidation,” says Musat. 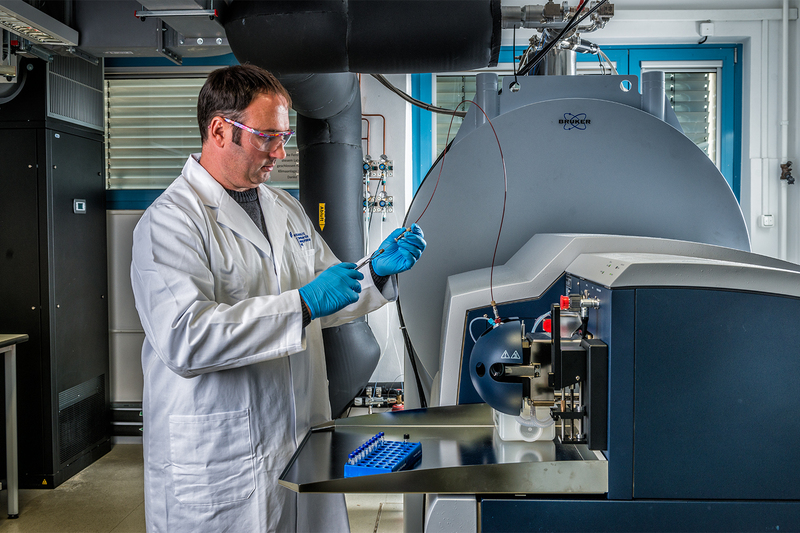 In order to uncover the secrets of ethane oxidation, Musat, who has been working at the UFZ since 2014, exploited the possibilities offered by the ProVIS technology platform. The Centre for Chemical Microscopy (ProVIS) combines a large number of large devices, allowing efficient, rapid and sensitive chemical analyses of biological samples, structures and surfaces at nanometer scale. For example, Musat’s team used fluorescence microscopy to show that Candidatus Argoarchaeum ethanivorans makes up the dominant share of the culture at around 65 percent of the total cell number, whereas two sulphate-reducing Deltaproteobacteria make up about 30 percent. 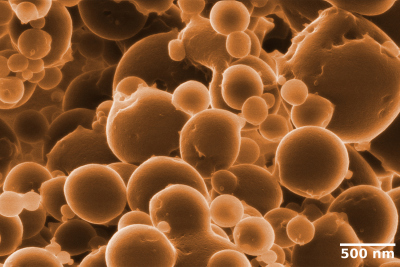 The metabolites and proteins were characterised by high-resolution mass spectrometry techniques and the chemical composition and the spatial organisation of individual microorganisms were determined by Helium-ion-microscopy and NanoSIMS. Using these methods, the researchers demonstrated that the archaeon is responsible for the oxidation of ethane to carbon dioxide, and the accompanying bacteria for reducing sulphate to sulphide. Formation of small vesicles indicate that Candidatus Argoarchaeum ethanivorans divide by budding. The researchers detected these structures with a high-resolution Helium Ion Microscope. The Archaeal cells are extremely small - on average, they are 100-fold thinner than a human hair. © Matthias Schmidt / UFZ. Furthermore, they observed that Candidatus Argoarchaeum ethanivorans does not form aggregates with the partner bacteria during oxidation of ethane, in contrast to cultures degrading methane, propane or butane. “The archaeon and the two types of bacteria grow mostly as free cells. Intercellular connections by nano-wires that would mediate the transfer of electrons, as shown with other cultures, are missing,” says Musat. For this reason, an exciting question remains: how do Argoarchaeum and the bacteria interact with each other? Metagenome analyses revealed that the archaeon does not possess known genes for sulphate reduction. This means that the electrons from ethane oxidation have to be transferred to the sulphate-reducing bacteria. Investigations conducted by NanoSIMS suggested that this transfer could potentially occur through sulphur compounds. “The archaea gain energy from the oxidation of ethane in an obviously complex syntrophy (community of cross-feeders) with their sulphate-reducing partners,” says Musat. In their hunt for the mechanism of electron transfer, Musat’s team investigated the culture using a helium-ion-microscope. 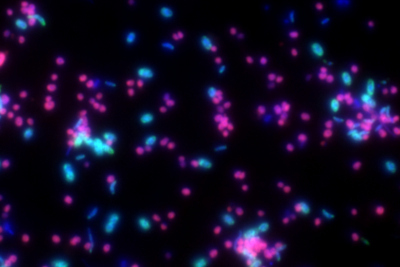 This analysis led to an unexpected finding: Candidatus Argoarchaeum forms small cellular vesicles, which remain attached in unusual tiny clusters, indicating that the archaea divide by budding. To date, research on anaerobic oxidation of ethane has been primarily fundamental. But taking one step further, the researchers’ findings could also be of use for industrial applications. “We are now aware of the mechanisms underlying the degradation of short-chain hydrocarbons by ‘alkyl’-CoM reductases, and we assume that the reverse reactions may be feasible. If demonstrated, this means biotechnologies to produce hydrocarbons using these or similar microorganisms,” says Musat. This could mark the beginning of new biotechnological applications to produce synthetic fuels, like the energy-rich butane, for example. Butane contains more energy per litre and can be much more easily liquefied than methane – a concept that Florin Musat and his team will keep an eye on for future research. The Centre for Chemical Microscopy (ProVIS) was set up at the UFZ in 2015 using funding of more than €12 million provided by the federal states of Saxony and Saxony-Anhalt, the German federal government and the EU. The combination of state-of-the-art equipment makes it possible to examine in detail not only individual cells but also their interactions within whole communities with a view to their potential future use in biotechnology applications. Based on a UFZ press release / Susanne Hufe.